Meimo Moroccan Restaurant in Windsor is one of the newest restaurants to open. 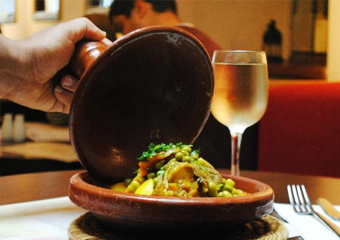 Offering a delicious combination of Meditterranean Dishes and Moroccan Cuisine – a first for Windsor. Meimo Restaurant opened in the spring of 2012 and has had amazing success so far. Meimo is run by local businessman Abdul and his wife Amina together with local chef Said (pronounced Sayeed). Between them they have been serving the people of Windsor since 1995 so they know what makes a good restaurant, what makes their customers tick and with this in mind they have created the success that is Meimo. If you are local to Windsor then you would know Abdul or Amina as they used to run another local Windsor Restaurant which we won’t name here as this article is all about Meimo Restaurant! Meimo is short for Mediterranean and Moroccan and the food is freshly prepared daily. They use exotic spices and colours to tantalise your taste-buds and this was certainly experienced when we visited recently. On the menu you will find various traditional Moroccan recipes like their fabulous Moroccan chicken – they wouldn’t give away the recipe as it’s a family secret but believe me it is worth every penny! You have to try it to know what I mean. Also on the menu they have mezze, chicken wings, Hummus and Calamari and these are excellent too. You can also get a burger (one of the best I’ve tasted served in a flat bread) or a pasta dish (bolognese or carbonara) and these taste exceptionally nice and not like one of those chain restaurants that make these items in bulk elsewhere and then just re-heat them. Urgh! I am a big fan of Tagine – a slow cooked chicken or lamb dish with cous cous, bread or flavoured rice – you have a choice of various fruits in with the rice like Prunes Apricots – or raisins and caramelised onions or vegetables. The Prunes and Apricots was my choice with the lamb tagine – washed down with a very nice bottle of Rioja – an excellent end to a Friday night in Windsor. Take a look at the Meimo Restaurant Windsor website which lists their latest menus and see for yourself. We wish Abdul, Amina and all of the staff the best of luck with their new restaurant – so far so good, keep it up Meimo!